Social Watch Philippines (SWP), a network of a hundred civil society organizations advocating for transparent, efficient, accountable and pro-poor use of public funds, noted that the ball is now in the court of President Rodrigo Duterte to remove the unconstitutional provisions and all forms of pork barrel allocations in the enrolled bill of the proposed P3.757-trillion 2019 budget. “To ensure a pork-free budget this year, we appeal to the President to impose his line-veto power over all the suspected unlawful amendments which were lodged in the 2019 budget bill,” SWP said. SWP also appreciates the statement coming from his spokesperson that the President will scrutinize every provision of the General Appropriations Bill (GAB). “This will erase any and all doubts that pork barrel has made its way into the 2019 budget,” SWP added. Senate President Vicente Sotto III announced on Tuesday that he has signed the enrolled copy of the 2019 General Appropriations Bill (GAB) but with “strong reservations” due to “unconstitutional provisions” and a P75-billion “internal realignment” worth of programs/projects under the Department of Public Works and Highways (DPWH). ​Social Watch Philippines (SWP) , echoes the call of Senator Panfilo Lacson for President Rodrigo Duterte to impose his line-veto power over the suspected pork barrel allocations which were lodged under the Congress-ratified ₱3.757-trillion 2019 national budget. Senator Lacson revealed in his scrutiny of the 2019 budget that billions of congressional pork insertions of several legislators have been retained in the 2019 General Appropriations Bill (GAB). The world free of poverty is yet to be. What we are seeing now is a World that is hurting, and so deeply that there seems to be no relief or end in sight. It is now 20 years from Rio when and where most everyone agreed humanity was at a defining moment. Back then, we thought we had the answer. Now, we are not sure anymore. The human race and the planet are ailing and the present is not the future we wanted 20 years ago. Former National Treasurer and Social Watch Philippines Convenor Prof. Leonor Magtolis-Briones questioned the P282.5-billion “presidential pork,” which is way higher than the P33-billion rehabilitation funds for Yolanda victims. She said a huge portion of the P2.264-trillion national budget for 2014 included the Special Purpose Funds (SPF) worth P282.5 billion, or the “lump-sum appropriations.” She said these funds replaced the controversial P25.6-billion pork-barrel funds that were realigned in key line agencies. Briones said it is not surprising that these funds are now the so-called presidential pork, since the disbursements will only be upon approval of President Aquino. Public funds came from the people and should therefore be utilized primarily to ensure better quality of life for the people. But dowe hear actual voices of slum dwellers, indigenous people, farmers, fishers and persons with disabilities when the local and national budgets are being formulated and planned? Peoples’ money should improve people’s lives. Government invested billions of public funds to end poverty; but global and national economic growth left 1.9 billion people poorer and hungrier and with less opportunity for shelter, healthcare and education. 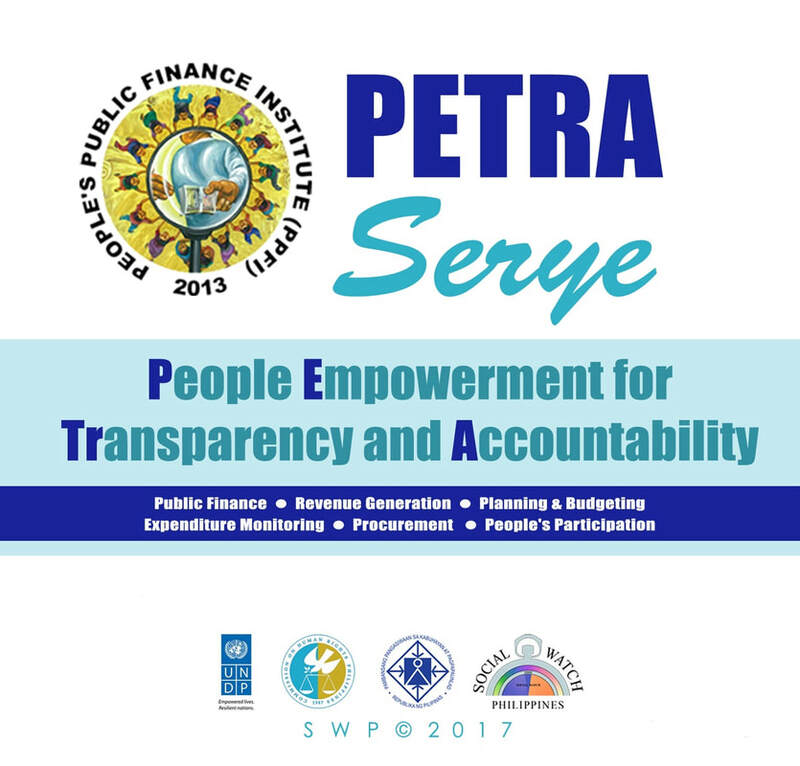 SWP spearheads the ceation of People's Public Finance Institute, a learning center for both state and non-state actors towards making public fiance a major concern of every citizen; not just of a very small group of experts. The institute set-ups local learning hubs based in unversities and operated by pool of cadres from the academe committed to share expertise and engage the public finance processes. At the global level, Social Watch engages governments, the UN system, and international organizations for the fulfillment of national, regional and international commitments to eradicate poverty and achieve social progress. It regularly monitors progress and shortfall in social development based on the government’s commitment to various international conferences and agreements as consolidated in the Millennium Development Goals (MDGs). ​Security was tight during the Papal address at the Opening Plenary of the UN Summit, so I missed these events as only a few civil society representatives could be accommodated, but certainly this was better than Addis Ababa during the 3rd Financing for Conference. The UN General Assembly formally adopted the Sustainable Development Goals (SDGs) at the opening session without further debate as the document had gone through months of debates ad revisions before Member States agreed on the final text. Social Watch Philippines (SWP) turn over 200,000 signatures to Senator Joseph Victor Ejercito in support of the passage of the Universal Health Care bill and Tobacco Tax Increase bill on Thursday, September 20 during a Manila Youth Leader’s Assembly held at Polytechnic University of the Philippines Sta Mesa.